Robert Penn was born in Riverside California and raised in Inkster, Michigan. The 59-year-old Detroit singer and guitarist learned his love of the blues from his Jackson Mississippi born mother�s musical brothers. His father was a great Motown fan and took the young Robert to see all his favourites. Tutored on guitar by Cornelius Grant (guitarist for the Temptations) and inspired by BB King, Robert recorded his highly sought after first album in the 80�s. At this point his musical career was halted by an acrimonious divorce and Robert decided to bring up his two daughters on his own. This led to an unwillingness to travel outside of his close neighbourhood and he took up teaching guitar to make ends meet. Over the years he has honed his musical skills in local bars and clubs as well as being the opening act for Aretha Franklin, Johnny Taylor (another of his favourites), Bobby Bland and Ray Charles. He has also acted as the musical director for David Ruffin, Eddie Kendricks and BB King. 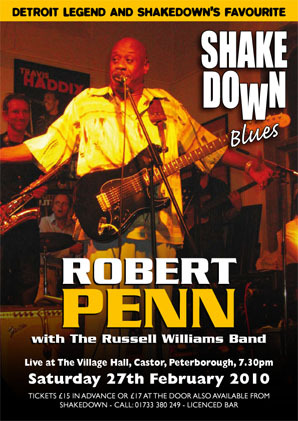 In February 2005 Robert flew over to England for his first triumphant Shakedown show 'live @ The Village Hall, Castor' and returned in September 2006 to play a superb solo set in The Stamford Arts Centre followed by an electrifying set with the Blues Crusaders to a huge wildly enthusiastic village hall audience. This time we have asked Hammond player Russell Williams from the Brenda Boykin concert to put a band together for Roberts third visit. Look out for the fireworks!